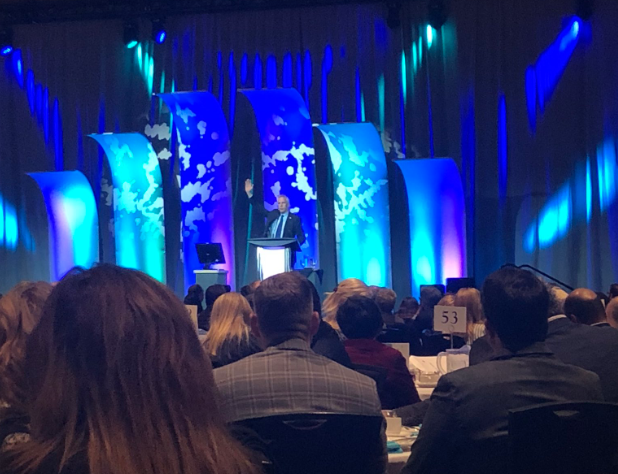 The Foundation brought these questions forward on Wednesday to a room of 900 community members committed to learning more and taking action at our 10th annual Mental Health Foundation Breakfast, presented by Qualico and Synergy Projects. Our message resonated, and our passionate community responded. Together, we raised $330,000 for integrated youth services in Alberta. Thank you, to all of you who attended, donated, and continued the conversations after you left the event. Youth aged 15 to 24 are more likely to experience mental illness and substance use disorders than any other age group. “Not a record to brag about,” said Mike. Still, despite the daunting reality of mental illness in our country, Mike assured those in attendance that each and every one has the power to personally impact mental health for the better. How does he know? Because your donations are already changing lives. Two years after breakfast attendees came together to raise $275,000, we were privileged to announce the operation of the first two publicly operated rTMS machines in Edmonton, accompanied by a story from the first patient to receive treatment. You can learn more and watch our new video here. The true heart of Wednesday’s breakfast was the powerful story shared by the Bowie family—Cameron, Janice, and Gabby. After 5 years of seeking help for Gabby, the Bowie family finally found a supportive team of clinical experts that taught them how to manage Gabby’s mental illness together as a family. But if their experience taught them anything, it is that 5 years is too long to be struggling alone. The Bowie’s five year experience made them want to change things for other families in the future. But they know that the current mental health system in Alberta isn’t set up to provide what is needed. Keynote speaker Dr. Ian Manion followed the family to paint a picture of a model for care that answers the needs of families like the Bowie’s. Dr. Manion has worked with youth and families for over 35 years in the mental health field. But more personally, he has struggled with depression since he was young, and now supports one of his own children in their experience with mental illness. The Bowie family’s experience is not unusual, he confirmed, and there are many reasons why young people and families continue to struggle. These include stigma, a lack of understanding around what is normal and what is mental illness, a system not tailored for its patients, poor transitions when a youth becomes an adult at age 18, and failure to meaningfully engage with youth. Say Ian, there is a wave of service providers internationally responding with a model called Integrated Youth Services. Approximately 338 sites have been identified worldwide that bring primary care, mental health care, substance use support, social services, and housing together under one roof. Instead of hospitals, centres are located accessibly in the community and resemble youth centres. They meaningfully engage both youth and families, and they provide the right care, at the right time, in the right place. Early evaluation of these programs are showing remarkable results for youth. And now is the time to bring this model to Alberta. This message was echoed by Mike Saunders as he concluded the program. The funds raised from the breakfast will help us move the model of Integrated Youth Services forward in Alberta. Already, the Foundation is working with community partners to coordinate the Alberta Integrated Youth Services Initiative, mobilizing funds and advocating action from government. In the coming weeks, we will be posting more information about Integrated Youth Services on the website. Please check back or sign up for our newsletter to ensure you receive updates. Thank you, from all of us at the Foundation.